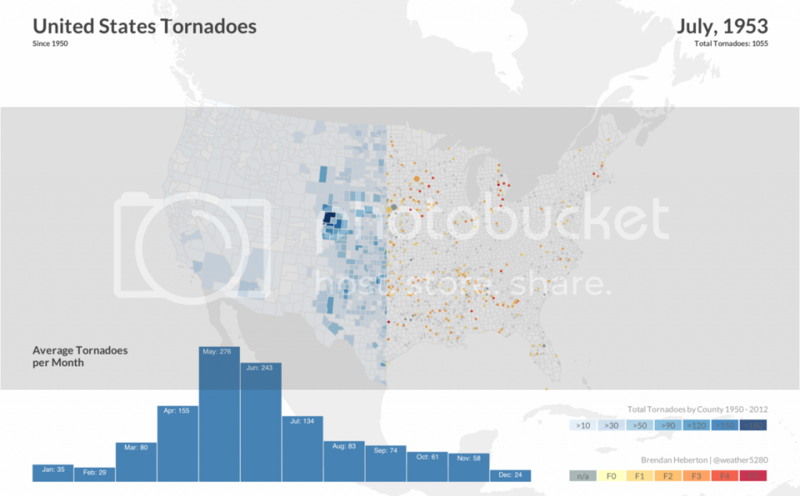 Last week United States Tornadoes put together a post on how "tornadoes progress across the United States throughout the year". This inspired me to dig through the data (every confirmed tornado since 1950) and experiment with different ways to visualize that data. While the original intent was to show the progression across the U.S. throughout the year in a different way than US Tors -- that idea morphed a bit as I started playing with client-side aggregation and simply animated every tornado (over 50,000) since January 1950. A distraction from the goal, but a fun one. Then it became the challenge of how to show just enough stuff to make it somewhat compelling -- but also 'okay' that it doesn't really answer any questions. In the end, the map shows two things. Aggregated tornado county by county since 1950, and if you have some time to kill, an animated loop of all tornadoes in the Storm Prediction Center (SPC) database by month, I still haven't made it to 2012. You can view the interactive version here. What might come as a surprise to many in Colorado is just how many dark counties there are on the map. Despite often being an afterthought as being a part of Tornado Alley, eastern Colorado sees a lot of tornadoes -- usually of the EF0 to EF2 variety. In fact, Weld County north of Denver lays claim to the most tornadoes of any county in the U.S. since 1950 with over 250. It has been a slow start to severe weather season across the United States thanks in large part to the very cold winter that is still in control across the midwest. 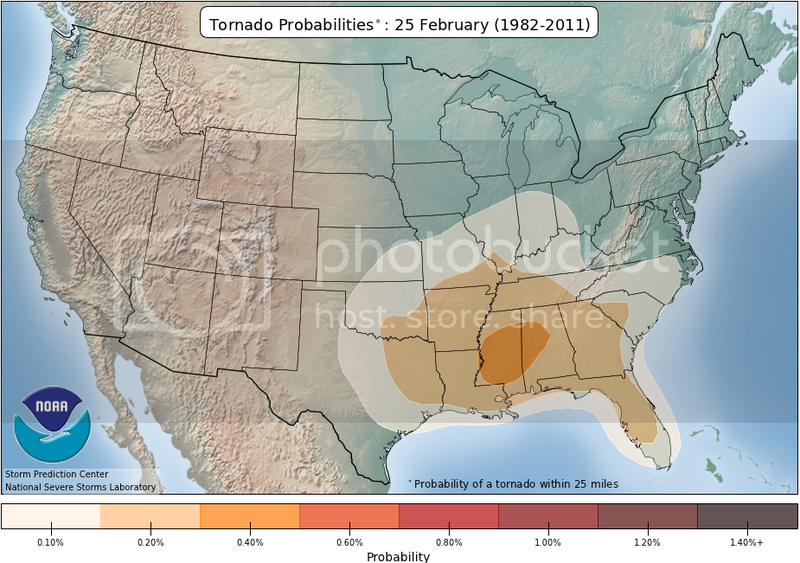 Climatologically the greatest threat for tornadoes during late February is across a limited area in the southeast. Colorado's risk stays pretty low until April, then grows from there through June. Nationwide, May is the biggest severe weather month with 276 tornadoes across the U.S. on average according to the SPC. As mentioned, tornadic activity is off to a slow start in 2014, and is expected to remain slow until we can break the cold. Through February 25, 2014 there have only been 41 preliminary reports of tornadoes compared to 114 through the same period in 2013 and 136 in 2012. Forecast is quiet for the next week or so for severe weather across the U.S. That could start to change as we head into March, and really start to ramp up come April.